A 5 diamond engagement ring is one of the most popular choices for proposing marriage. Multi-diamond engagement rings have become quite popular choices for engagement rings. 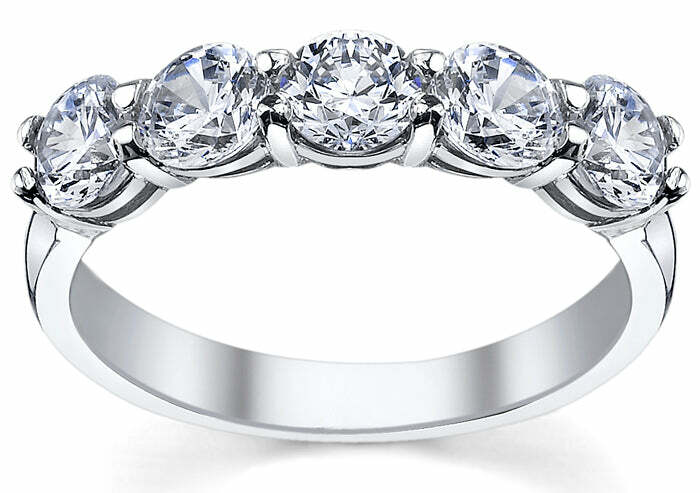 If a simple solitaire diamond won’t do, then a 5 diamond engagement ring is the perfect answer. These rings are among some of the most popular engagement rings at the moment because they add more sparkle and glamour than a plain solitaire engagement ring. What do you think about this growing trend? There are numerous 5 diamond band ring styles to choose rom. You can select different carat weights, diamond cuts, or even select a ring that features gemstones instead of diamonds. You can even select from different setting styles and precious metals. Our rings are sure to impress anyone that is to receive one and she will certainly not hesitate in saying yes. If you would like assistance in finding your dream 5 diamond engagement ring, not only to we buy diamonds, but we also have GIA graduate gemologists available to assist you with any questions or concerns that you may have. Please do not hesitate to contact us at your convenience. We also have other 5 diamond engagement rings available in our diamond accented engagement rings page.